Subscriber since September 2013 – 2 YEARS! 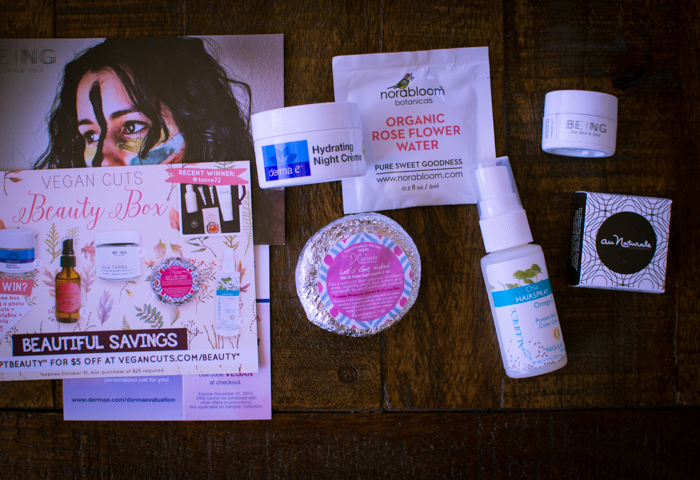 September’s box has 6 awesome finds with a total value of $41! Description: A colorful and texture-rich organic creme eyeshadow made with essential oils to nourish your skin. Since I still struggle with creme shadows – I thought I’d look up some tips. 1. Use your fingers or a flat makeup brush. 2. Use small amounts at a time to build up the color. 3. 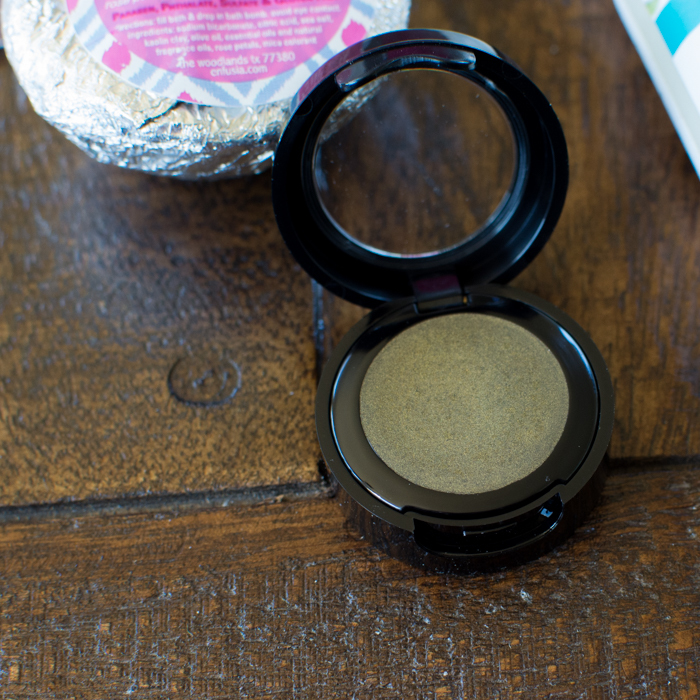 Use as a base for powder shadow or for solid single-color coverage. 4. Use a primer or translucent setting powder to eliminate creasing (maybe). Addiction is described as a ‘deep, shimmering gold‘ It is deep, so deep it’s more of an olive with gold shimmers. It’s gorgeous and I think it will look great with my hazel eyes. Description: Thoroughly moisturize and plump skin to reduce the look of fine lines and wrinkles with this ultra-hydrating night crème. This extra-rich, deeply penetrating formula delivers the unmatched hydrating properties of nature’s moisture magnet, Hyaluronic Acid (HA). A single molecule of HA can hold up to 1,000 times its weight in water, binding moisture to help plump, soften, smooth, tone and rehydrate skin. Enriched with anti-aging antioxidants, Vitamins C and E, and soothing Aloe, this formula helps defend skin from free radicals and the effects of the environment. 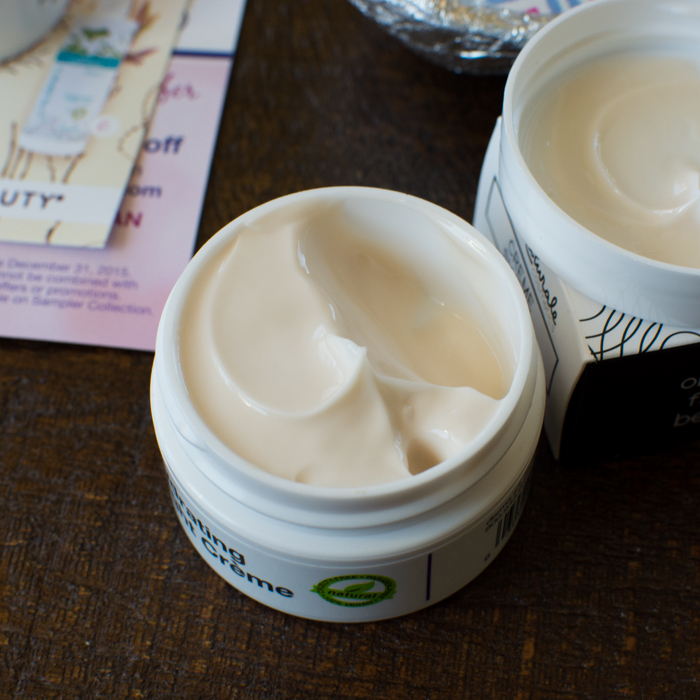 Ideal for dry, dehydrated skin that needs richer moisture throughout the night, this crème delivers maximum hydration while helping diminish the signs of aging for softer, smoother, younger-looking skin. Derma E is a 100% vegan, cruelty-free, paraben-free, sulfate-free, mineral oil-free, lanolin-free, gluten free, GMO-free company. I might have talked about it before, but Derma E is probably one of the first natural-leaning products I came across 10+ years ago when I was battling breakouts in my early 2Os. I picked up a few of their products at a local Vitamin Shoppe. Even though my skin woes stemmed more from diet than I knew at the time, I feel like Derma E helped educate me on my path to better products and better food. This was my first time trying out their night crème and I absolutely love it. It looks thick like Noxema but absorbs into the skin beautifully. It has a nice light fresh scent and didn’t cause any weird breakouts or blockages overnight. It contains hyaluronic acid—which I’m a huge fan of. I think several of my favorite skin care products have it. Description: Cotton pads dipped in organic rose flower water to detoxify, harmonize, and rejuvenate your skin. Ingredients: Organic Bulgarian Rose Water, Organic Witch Hazel Distillate, Radish Root Ferment Filtrate. Description: A pure blend of Australian black clay + electrically activated charcoal to open pores and draw out toxins. In a 2:1 ratio of clay:water mix to create a paste. Apply to cleansed skin in a thin layer and relax while allowing it to dry. Rinse with water to remove. 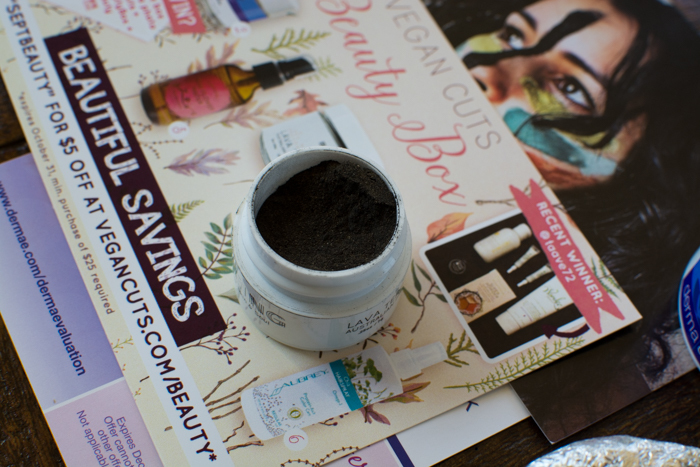 I loved this detoxifying mask! I’m a sucker for anything charcoal/clay/sulfur based and this had 2 of those. My skin felt great after a sesh. Description: Mini bath bombs crafted with skin-softening baking soda + moisturizing oils for a delightful bath experience. Loved it!! It foamed and smelled great and the little flecks of lavender and rose didn’t require any special clean up. Description: Protein-enriched hair spray made with organic chia seed oil to add a soft, natural hold without plastics or silicone. DREAM WORDS. Without plastics or silicone. Do you know how hard it is to get that ish out of your hair?? This hairspray made from chia seeds freaking works too. Just amazing. It’s got a light weight and soft herbal scent. Love it!